This is the Official website for MODERN SON and music video "Day After Day"
Music Video "Day After Day"
Leo Guzman-Sanchez a young boy with Autism featured in music video written by his father. In 2011, Paul Guzman-Sanchez had a wish that only a parent of an autistic child could have—to show the challenges that his son goes through. A Los Angeles-area musician and video producer, Paul wanted to show the world that an autistic child can fully embrace the world and share in the experiences of everyday life. The video features autistic 13 year-old Leo Tre' Guzman-Sanchez, with a special cameo appearance by his sister Brianna Guzman-Sanchez and brother Brandon Guzman-Sanchez. Paul Guzman-Sanchez is a modern renaissance man—a third generation guitarist on his dad's side, as well as a bassist, keyboardist, percussionist, singer and songwriter. 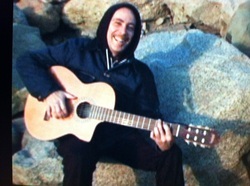 A professional recording artist himself, Paul always wanted to share the joy of music and music-making with his son. When Leo was diagnosed with autism, the thought of him ever being able to jam with his dad seemed like a remote and nearly impossible dream. But one day Leo started to sing songs he heard on the TV with perfect pitch and timing. Weeks later, Paul wrote a song about Leo, teaching his son the chorus. Leo nailed it perfectly with almost impeccable timing and phrasing. The experience marked a breakthrough, the first time ever that father and son really communicated on a deeper learning level. With tears in Paul’s eyes, father and son sang the chorus together over and over. Today, Paul says Day After Day is special in more ways than one. The tune will always have a special place in this father’s life as it marks a turning point not only for Leo, but for a father and son as well. According to singer, songwriter and video director Paul Guzman-Sanchez, the biggest support for the Day After Day project has come from his family, without whose love and patience none of this could have happened. Through good times and bad times, the love, dedication, and commitment has and will always be there. Director of Michael Jackson's "This Is It"
I watched it in the office and had to excuse myself and go blow my nose and finish up with my tears. Thanks for sharing that with me!! Music Video "Day After Day" Now this is nice, beautifully done. Brought tears to my eyes. I love it. Hi Paul,"God Bless you & The family! This is Wonderful!!" What a great way to give hope to those who struggle with this and need inspiration. I admire you guys and your courage to be awesome parents and give Leo the best care possible so he can have the best at a normal life. My love to all of you guys. Love the video. Thanks for sharing it with me. Paul: Thanks for sharing. This is truly beautiful and I’m happy to share it with friends also living the life of autism. Hope this opens many new doors for you! Interviewer Andriana Olivares for CSUN radio had Leo sing "Day After Day' on camera for her interview. Turned out to be a nice interview under a shady tree in the hot summer heat at the Autism Speaks Walk at The Pasadena Rose Bowl. Leo and his dad sang and talked about the achievements leo has made and is still making. The segment will be posted here on modernson.com this week. "Day After Day": an anthem for the autistic community released for families living with an autistic child, watching the video Day After Day will strike an emotional nerve that dwells deep inside all parents of autistic children. Autism is a growing problem. According to the advocacy organization Autism Speaks, it is estimated that one in every 110 children is diagnosed with autism, making it more common than childhood cancer, juvenile diabetes and pediatric AIDS combined. An estimated 1.5 million individuals in the U.S. and tens of millions worldwide are affected by autism. Government statistics suggest the prevalence rate of autism is increasing 10-17 percent annually. Papa Jacks Skateboard Park in Malibu, CA. Due to poor coordination, lack of muscle development, and underdeveloped gross motor skills, skateboarding can be tremendously difficult for children with autism. Leo has learned to overcome these and other obstacles, proving that he can conquer autism and lead a more normal life. Paul Guzman-Sanchez. 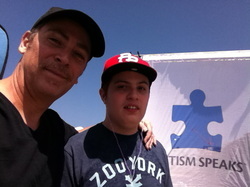 This Los Angeles father of three believes that with love, patience and commitment, parents can affect tremendous changes in the lives of their autistic children. In recent years, an autistic culture has developed. Many individuals believe in seeking a traditional medical cure, while others believe autism should be accepted as a difference and not treated as a disorder. When my son was diagnosed with autism in 2000, there were very few support programs available for help. My wife and I had to do our own research to understand this neural disorder and how to best deal with it. Over the past decade or so, autism has grown to epidemic proportions, but so has public awareness. There is no cure at the moment, but the medical industry is working valiantly to fine one. In the absence of a cure, we parents of autistic children often look to one another for support and answers. We frequently learn from one another how to help our children reach their true potential. Many of us are convinced that with love, patience and commitment, we can help our autistic kids be the best they can despite the challenges that they face, day after day.